Big Finish: Doctor Who - THE BEAST OF ORLOK Review | Warped Factor - Words in the Key of Geek. I’ve recently listened to the rather intense Series 4 of 8th Doctor and Lucie audios, culminating in To The Death. Going back to this early Series 3 story helps remind me how much fun the 8th Doctor and Lucie are together and why the events in To The Death had such an emotional impact. 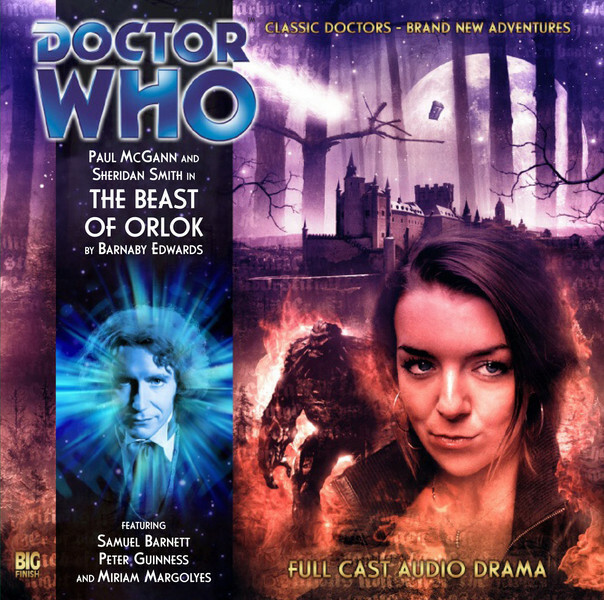 The Beast of Orlok is a fairly generic and slight story, if I’m honest, but Paul McGann and Sheridan Smith, along with a note perfect guest cast, lift it and make it an enjoyable listen. The story revolves around the legend of the golem which, bizarrely, the production team suggest they hadn’t done before – but I’m sure Grand Theft Cosmos also features a golem of some sort, but it’s been a long time since listened to that story, so I could be misremembering. It is set in 19th century Germany, the Black Forest to be exact and sees the Doctor and Lucie discover galactic despots searching for genetic experimental babies in Dr Frankenstein’s castle (not literally but the parallels with the stereotypical horror film version of that story are fairly blatant). As I say, the cast are what makes this story. The extras focus quite a lot on the calibre of guest cast and heading it up is Miriam Margolyes who is wonderful as Frau Todd. It also features Nick Wilton, Peter (Holy Terror) Guiness and Trevor (Revelation of the Daleks) Cooper. My favourite performance, after the delightful Margoyles, is Samuel (History Boys) Barnett who is great as the ‘romantic’ lead pairing up with Lucie for much of the story (I’ve been a fan of Barnett ever since seeing him in the underrated and little known comedy, Beautiful People). My only problem with the story is a lack of sense of place. Throughout the story I never really felt like we were in 19th century Germany. The director and writer, Barnaby Edwards, made it clear he didn’t want German accents – fair enough, quite a few directors avoid accents in foreign set stories and it isn’t a huge problem, but much of the dialogue doesn’t feel like how 19th century people would speak – or at least how they generally speak in drama. It’s a sharp contrast to Mary’s Story which had the speech patterns and language they felt right for the period. I think the script relies too much on the audience’s previous knowledge of a gothic horror at the expense of actually providing its own sense of time and place. This is further compounded by David Richardson’s asserting in the extras that this is 17th century Germany!! I do like the revelation that Hans and Greta are a ‘real-life’ Babes in the Wood – genetic experiments left on Earth and hunted by a cruel dictator. There are some thrilling scenes in Baron Teuful’s laboratory and some cracking dialogue between the Doctor and Lucie (I particularly like the Burger Master gag). I think the German puns are a little self-indulgent on Edwards’ part, "Tod" is German for "dead", "Teufel" means "devil", and "Pausbacken" means "chubby-cheeks", but they don’t detract from the story. Not the best 8th Doctor/Lucie story, but by no means the worst, and a solid if slightly ordinary adventure.